A new standard for 4K video processing - simple, fast and quality-oriented. Edit, shrink, resize and encode 4K/5K/8K and HD/SD videos with minimal effort. Prepare video for social media - your essential Mac video helper. 100% free, reliable and no expertise required! macXvideo is engineered for peak performance in processing 4K videos. The unique GPU processing speeds up the workflow to where others can't, ending computer overheating or freezing. An exclusive compression engine is made to compress video like no one else, with minimum output size and every detail reserved. Within a few clicks, you can make amazing movies like a Pro. Advanced compress engine ensures to shrink video by up to 90% without quality loss, for more space and faster sharing. 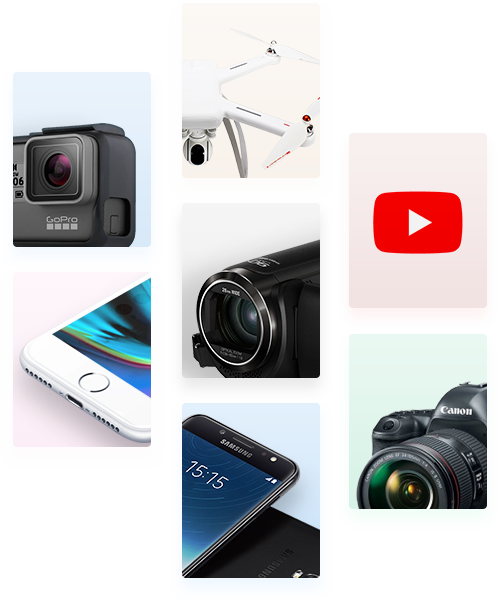 Cut/crop/rotate/split videos to be perfectly sized for YouTube, Vimeo and Facebook easily, with no need to be a pro. Quickly encode videos to MP4, H.264, AVI, MKV, MOV, MP3, etc. and deliver your final file to social media, mobile flawlessly. 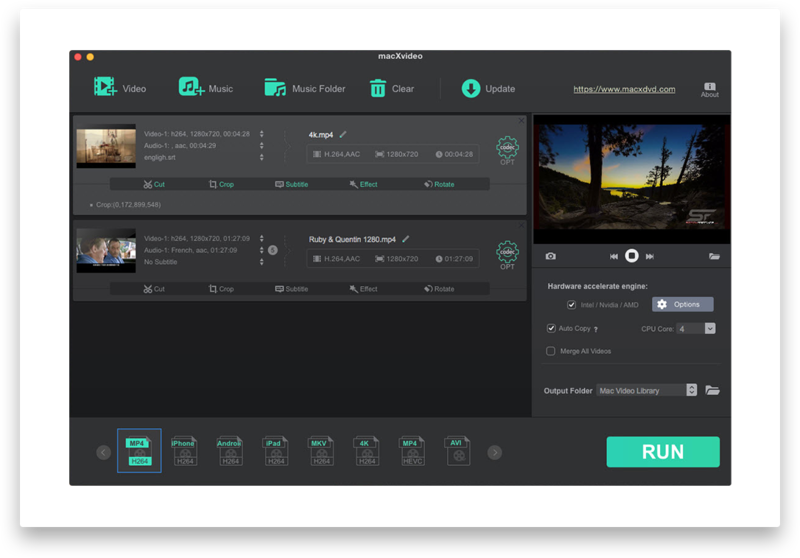 No matter your footage is from smartphone, tablet, camera, DSLR, action cam like GoPro, DV, Camcorder, car DVR, drone or hard drive, macXvideo will read them all. It holds the largest video/audio codec library (as many as 370) and accepts any videos, regardless of the formats MP4/MOV/MKV, codecs HEVC/AVC/XAVC/ProRes, or resolutions 8K, 5K, 4K 60fps/30fps, 2.7K, 1080P, 720P, or lower, making it ideal hub for all video processing workflow. 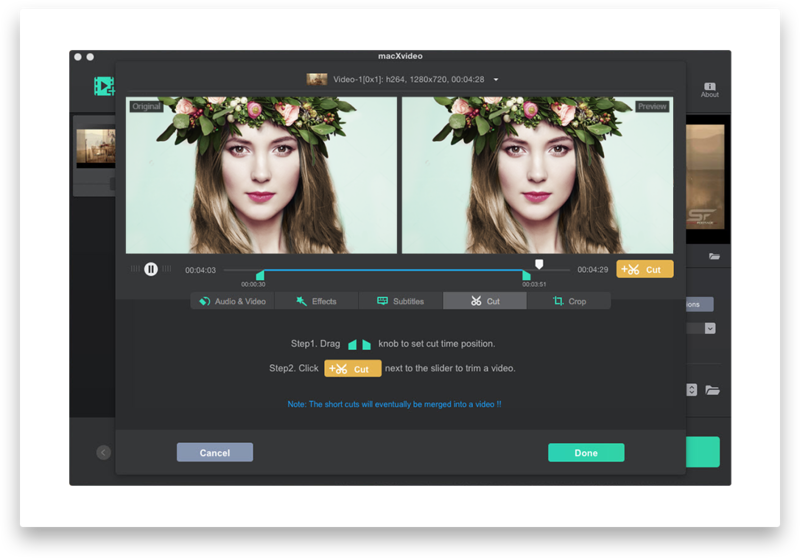 macXvideo features a lightweight interface that focuses on usability, making it simple and butter smooth for every video editing project without exposing your computer to heavy workloads. Whenever you need to make a highlight reel of a summer adventure, or start a YouTube channel, get macXvideo that does it all. Cut, trim and slice video to capture the essence. Add subtitles and effects to make your video stand out. Split video into smaller pieces and merge them into one. Crop and rotate video to fit screens or share on YouTube. 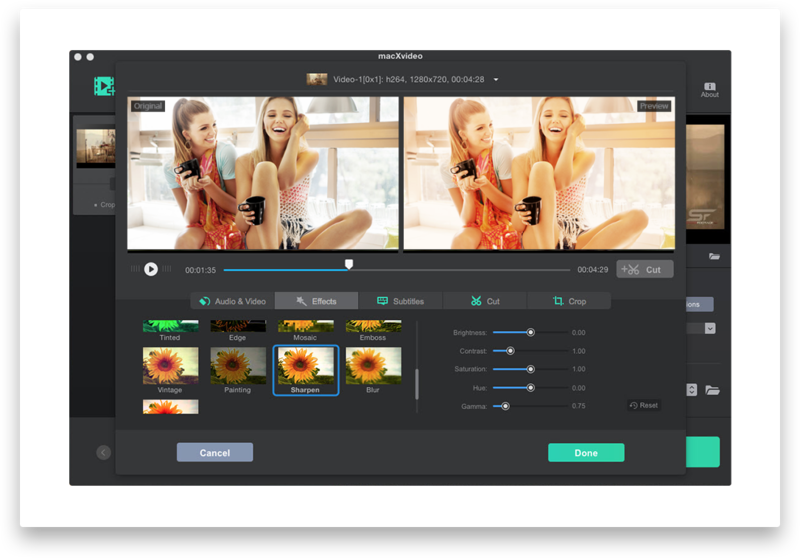 Processing 4K videos requires more graphics horsepower than ever, macXvideo is ready for 4K with the best stability and compatibility, but drastically less CPU usage. It is built in a forceful video and audio converter, purpose-built to get the perfect file for your final streamline delivery, whether you want a stutter-free playback, save to Macbook, or share online. MOV, HEVC, MKV, AVI, etc. Transfer 4K HD videos to iPhone iPad Android with ready-made profiles. Transcode videos into web-ready file optimized for social sites like YouTube. Encode videos to MP4 H.264, perfect for storing on NAS, USB and more. Decode HEVC to H.264 MP4, etc for better compatibility. Encode video to HEVC with higher quality but smaller size. Uniquely hew out Intel/Nvidia/AMD hardware accelerations. This dramatically speeds up 4k video processing job up to 5x faster than others. The cutting-edge compress engine is tailor-made for unbeatable video compression efficiency, getting video downsized by up to 90% with high fidelity kept. The revolutionary interface is geared towards users of all skill levels. It streamlines 4k video processing workflow and enables quick access to every feature you need. Absolutely amazing software. All the critical editing features like cut, effect, to name a few, are packed into the lightweight and fairly sleek interface, where I can turn my footage into impressive production within a few clicks. Most of all, there is no ads or pops up. I tried a wide variety of software to handle my GoPro footage which I'd like to share online, and very often I found that my CPU usage reaches 94% and the process is too slow. To be honest, macXvideo is the only free program I satisfy. Cannot believe the free tool even supports HEVC hardware encoding, at such a fast speed. I was planning to squeeze hundreds of my recordings in diverse formats into my new Macbook. I tried several tools and am happy to say macXvideo encode all my videos with good compression ratio and achieve the best balance between size and quality. 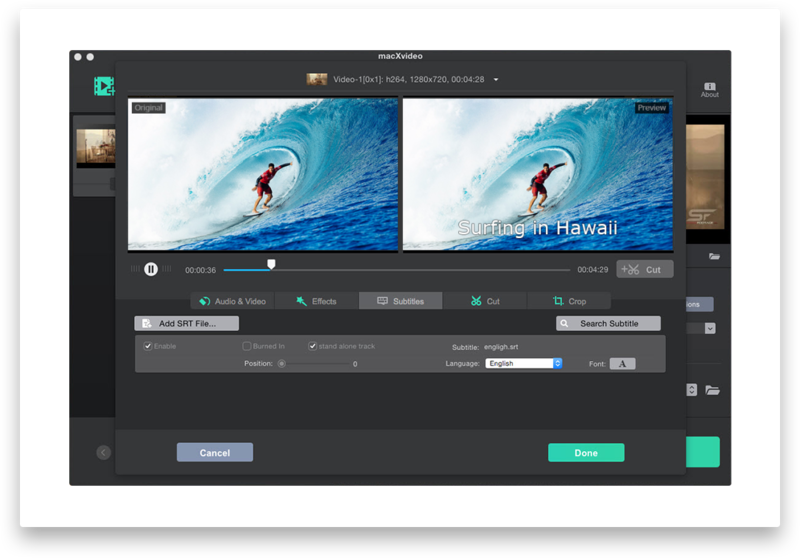 Be the first to try macXvideo and experience how simple it is to resize, encode and edit video! For us, the greatest satisfaction from customers is our primary concern. It needs our efforts and your valued suggestions. We welcome any feedback and suggestions. 4K Video Processing [Hardware Acceleration Enabled] Resize, convert, edit and play 4k videos without stutters, lags or freezes. 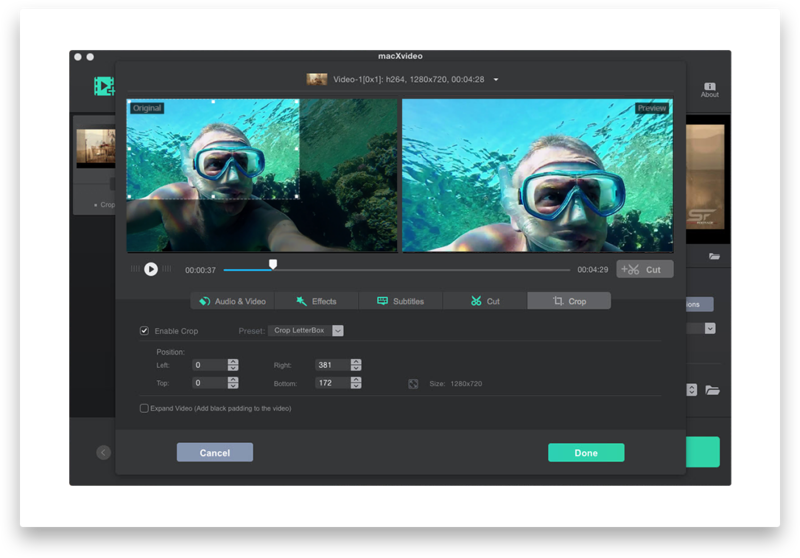 Free Video Editing Software for Mac Edit videos from GoPro, iPhone, DJI, Camcorder, etc without needing to be a pro. How to Compress a Video on Mac [Best Size-Quality Ratio]Learn how to shrink large-size videos to upload, store and play them easily. [Review] Top 3 Free Video Converters for Mac Freely convert 4K/HD/SD videos among HEVC, H.264, MP4, AVI, MKV, MOV, etc. [Tutorial] How to Cut/Trim Videos on Mac FreelyGet handy video cutter to trim video into smaller clip and share it effortlessly. [Thorough Guide] GPU-Accelerated HEVC Video ProcessingEncode, edit and play 4K HEVC videos with GPU accelerated. Solve high CPU usage, stuttering, format incompatibility and other issues. MP4, MOV, MKV, M4V, FLV, DIVX, XVID, HEVC, H.264, AVI, MPG, MPEG, VOB, 3GP, 3G2, WMV, ASF, RM, RMVB, QT, DAT, OGV, WebM, DVR-MS, VRO, MXF, TOD, MOD, M4P, AVCHD, MTS, M2TS, TS, DV, F4V, VPX8, G2M4, ICOD, YUV411, MP2V, etc. MP3, M4A, WMA, WAV, OGG, AC3, AAC, AIFF, FLAC, APE, MKA, AU, M4B, M4R, AA, AAX, M4P, etc.